SEKURE Storage Solutions delivers the most versatile, adjustable, and future compatible weapon storage system available today. All components are interchangeable with any of the weapon racks or cabinets offered. Store any combination of weapon types; there is no need to separate your weapons for storage in the same rack, cabinet, or panel system. If your weapon inventory increases or changes, simply accommodate the new inventory in minutes by adding or moving system components. ​No other system offers such high density storage capability either. Each weapons rack and cabinet is designed for easy installation on mobile aisle systems to provide even higher space efficiency. All components are interchangeable with any of the racks or cabinets offered. These systems meet the requirements of AR190-11 and OPNAVINST 5530.13C, and in addition, more than 30 of our weapons racks have been awarded NSNs (National Stock Numbers). Our NSNs are configured for rifle, handgun, machine gun, gear, and crew served storage. SEKURE storage systems are designed for installation anywhere, including in armories, tactical vehicles, containers, aboard ships or in aircraft, within evidence areas, and many others locations where secure storage of weapons and gear is needed. Increase floor space. With all the same great features as our swing open, Stackable Weapons Rack, the new Bi-Fold Weapons Rack can save you more than 31% in floor space. Extremely flexible small arms storage. Our Stackable Weapon Racks will securely store your weapons vertically and/or horizontally utilizing specific mounting components. These racks offer smooth gliding retractable doors, taking up the least space of all our weapon racks. Evidence & Weapon Storage. With locking tambour-style roll-up doors, our Weapon Storage Cabinets make them attractive options for securing police weapons and evidence. All steel roll-up tambour door. Designed for extra-secure storage of any size rifle, shotgun, handgun or personal defense weapon stored vertically or horizontally. The ultimate in space efficiency. Just as versatile as the standard Stackable Weapons Racks, but with a smaller foot print, these units can be secured to walls, floors and each other. Sturdy gear storage lockers designed specifically to securely contain important apparel, gear, supplies, and other resources. Extreme weapon storage mobility. Our new Mobile Weapon Cart has a capacity of up to 20 Weapons. Complete with rugged casters, handles and dual universal back panels. Secure storage for the big guns. 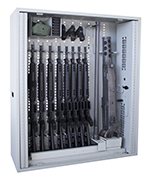 Our M2/M3 Rack is manufactured with heavy gauge steel and designed to securely store four M2/M3 machine guns and eight Barrels. 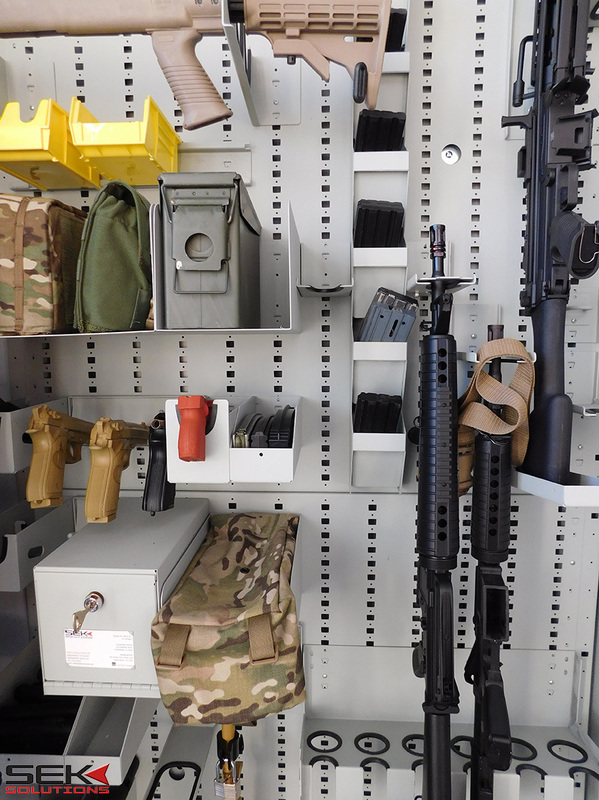 The flexibility of our storage systems, allows you to combine any of the components with any weapons rack or cabinet to achieve your own custom solution.